Technology that‘s always one step ahead. What are BOTS and why should I be concerned about security? Bots and automated threats are growing at an exponential pace. Their sole purpose is to subversively seek out vulnerabilities in websites across the internet and exploit them for someone else’s gain. 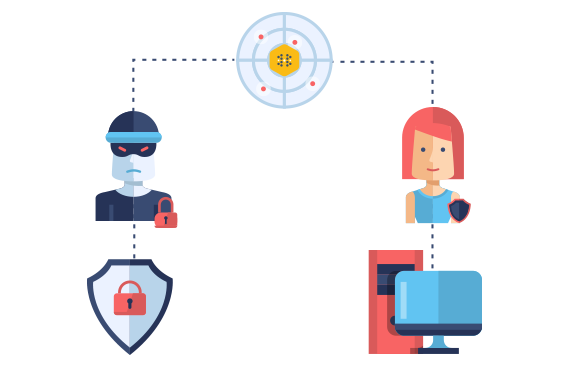 They are used to steal and divert web content and unprotected data from your site such as merchant info, transactions, and company and personal information. They then use this stolen content in malicious, and often criminal ways to defraud you, your customers, and millions of others across the world. These bots are designed to bypass and evade even advanced detection techniques and their rapid evolution puts most traditional web security solutions at a disadvantage. Simply put, they are outpacing the technology used to protect against them. BOTS are designed to scrape valuable data and content from your website for the purpose of ranking higher than you in search engine results. These BOTS essentially target valuable SEO content and information that you've worked hard and dedicated your resources to put in place and republish that content elsewhere on the web. This allows those other sites to outrank you and therefore steal valuable traffic from your site. Form spam is often considered one of the most frustrating issues web owners deal with on a daily basis and it’s a drain on time and resources to find ways of blocking it. Form spam BOTS submit unwanted information over and over again, continually gaining traction once it breaches your security measures. They are often very difficult to eradicate. Some of the unwanted data submissions involve advertisements, links to product offers, phishing URLs used to steal your information, and other types of links. Spammers work diligently to create BOTS that automatically seek out web forms for the purpose of transmitting unwanted and malicious information. These form spam submissions proliferate throughout a company’s email system in order to generate traffic, ad revenue, or direct people to phishing sites that collect personal information for criminal use. In order to combat these form spam BOTS, websites often employ a series of textual or picture quizzes to the user submitting the form such as CAPTCHA. These tests are somewhat effective for standard BOTS, but are annoying to website visitors and often lead to abandoned contacts or site sales. In addition, BOTS are evolving to the point where these measures are becoming obsolete and ineffective. Companies that depend on their website to generate sales are also dependent on the data they gather through their product and customer analytics. This information is used by their sales and marketing team understand the audience segments and what products or services are gaining market traction. BOTS skew analytics results and make it difficult to gauge performance which effects their ability to be accurate with marketing strategies. This is especially damaging to sites that depend on ads to increase revenue. Bad BOTS absorb bandwidth and services, overwhelming servers with non-human traffic. Over time, the cost of BOTS and the load they put on your web resources increases exponentially. It's a real and significant cost to website owners. Unlike other BOT security detection and mitigation services, we utilize a “human presence” approach, essentially mapping natural, organic movements and applying that logic to all future site visits. The Human Presence™ solution is completely transparent and frictionless to the site visitor. Human Presence™ identifies the non-human behavior within milliseconds, providing a tool which allows the site operator to choose how to respond to suspicious traffic. For instance, the site operator can allow human visitors to continue on the site without interference, while choosing to automatically test the suspected non-human site visitors with additional verification steps such as a CAPTCHA or routing the bots elsewhere. Moreover, using proprietary Ellipsis techniques, Human Presence™ identifies non-browser spambots that are making automated HTTP requests to a form’s action that wreak havoc with all site forms. In short, The Human Presence™ solution enables website owners to improve the user experience for legitimate human users while identifying and defending against spambots and other malicious traffic. The Human Presence™ technology is based on human behavior analysis, proprietary algorithms, the Ellipsis historical human behavior database, advanced risk detection and machine learning techniques. The machine learning tools allow the Human Presence™ model to evolve and improve over time, providing highly sensitive discrimination between human and bot behaviors and visitors. Human Presence™ actively runs in the background of your website hidden from site visitors. This “ActiveForce” environment uses our proprietary behavior analysis to invisibly detect and record individual session behaviors. Our algorithm uses this information to construct smart profiles–a sort of digital fingerprint–to actively gauge future site interactions and protect against unwanted and/or harmful traffic. Our algorithm analyzes even the slightest nuances in micro-gestures and activity so, when behavior that is uncharacteristic to humans is detected, we immediately dispel the robotic invaders and patch any potential future vulnerabilities. By changing the game in this way, we’re able to outsmart malicious bots and advanced threats. Our technology is always one step ahead and we don’t have to rely on automated security threats to be defined before we can take action. We'd love to spend a few minutes walking you through how easy it is to secure your website and server from malicious activity. Whether you manage a single website, you have a manage your own hosting servers, or you're a CTO for an enterprise-level company, our Ellipsis team can demonstrate our proficiency in digital security. Not a one-size-fits-all solution. You have complete control over any and all traffic to your site. Designed to be easily integrated with your site by including only a small JS code snippet. Incredibly effective no matter the traffic load or site complexity. We can scale with you. Learn more about our pricing. Built to protect against the most intelligent BOTS that exist and are getting smarter every second.